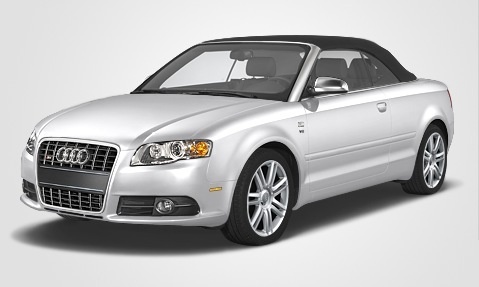 Audi's A4 line has a hot rod variant that comes in three configurations: sedan, wagon, and cabriolet. The scarlet letter here, however, is S. For 2008, the S4 sedan receives a few upgrades as changes. At the heart of all these S4 configurations spins the remarkable 4.2-liter V8 that produces 340 hp at 7,000 rpm. Crammed into this luxury performance sedan, the V8 tows the S4 from 0 to 60 in 5.3 seconds with the six-speed manual transmission. A six-speed Tiptronic paddle-shifted automatic is also available. All of this power flows into the great Audi Quattro four-wheel-drive system, but this is not your father's Quattro. The S4 performance version is set for a 40/60 front-to-rear power distribution, giving the car more aggressive cornering capability. A sport-tuned suspension that includes bigger wheels, performance tires, and more powerful brakes helps to keep things under control. The handling is set to moderate understeer and will only power-oversteer when flagrantly provoked. Yet, you can still do your daily city driving chores with the S4 - all year round. The interior combines the A4's fine interior fit and finish with the appointments of a serious performance car. Up front you will find Recaro leather-covered, power-adjustable sport seats, which feature aggressive bolstering to keep driver and front passenger firmly in place. The back seaters, however, will only be comfortable, as in the A4, if they are children - there's not much leg space back there. Naturally, as an Audi, safety equipment abounds. Standard features include: antilock disc brakes, electronic brakeforce distribution, brake assist, stability control, tire-pressure monitor system, front-seat side airbags and full-length head curtain airbags with optional rear-seat airbags. The A4, the basis for the S4, received top ratings in Insurance Institute for Highway Safety frontal-offset and side-impact tests. Of course, with all this performance you're not going to pass gas pumps easily. EPA estimates 13/20 mpg city/highway, with premium gas, along with a gas guzzler tax upon purchase. What's your take on the 2008 Audi S4? Users ranked 2008 Audi S4 against other cars which they drove/owned. Each ranking was based on 9 categories. Here is the summary of top rankings. Have you driven a 2008 Audi S4?